The whole world already know about the destruction brought about by Super Typhoon Yolanda/Haiyan and our country need all the help that we can get. 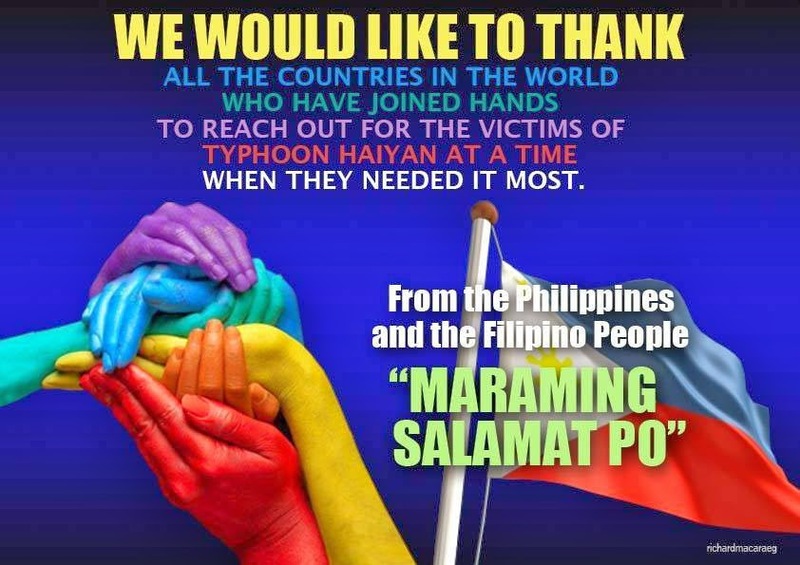 It's very heartwarming to see that a lot of nations are lending their hand to our country especially to those that are very much affected in the Visayas. WE ARE SO THANKFUL for all the help that we are receiving and it's overwhelming. We can feel the love and care that many nations are giving to us in this time of crisis. Medical teams, food, clothing water and other important supplies are being sent our way to help the needy. Slowly, the Visayas region will get on their feet again and will start their life again.... it's not an overnight thing but they will certainly rise again.. The medical teams and big hospital ships from China, US and Britain are helping those that are needing medical attention. A lot of people died but many have been injured. They have all medical supplies and equipments and I'm sure that also have advair diskus for those that asthma.Even saw in the news that babies are born in the makeshift medical hospitals too after few days of typhoon. I am praying that all those nations that gave their help will be blessed and will continur to help those nations that are in need. THANK YOU! from all of us. As you all know our country has been badly hit by typhoon Yolanda (Haiyan) that caused too much destruction and deaths in the Visayas Region. We all need to act and share whatever we can. To help survivors, a joint effort by Davao Bloggers Society and Filipino Bloggers Forum, which I am an active member) has been undertaken to join the relief operations by raising a total of P100,000.00 to finance and produce 1,000 hygiene packs for the victims. 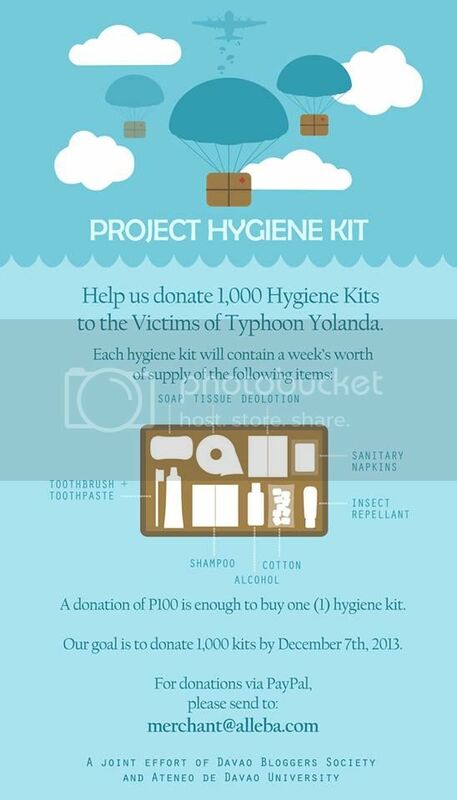 Each kit costing to PHP100 or USD2.50 will contain toiletries and other essential goods for a week's use of one person. Hygiene kits were chosen to be donated as this is something that is not yet prioritized by many donors. I can’t believe it, November is already half way thru and in no time it’s gonna be Christmas already. I’m pretty much excited to celebrate the Holidays this year for it’s going to be extra special for our family. My 2 sisters and their families who are living overseas will come home with God’s grace to celebrate the holidays with us. It will be our family reunion for over 10 years that we are all apart and I’m praying that we’ll be able to all be together in this special season. Christmas is a time for family reunion and bonding and nothing beats the warmth of smiles and hugs that every family member can give to each other. It’s a season for giving and sharing. 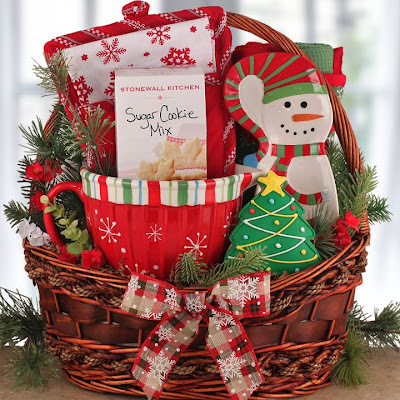 Christmas is not complete without lots of food and of course gifts. Kids will always be excited to open their presents on Christmas Eve and Christmas day for they are hoping to get what they wished for. Actually, I am so happy because I’m almost done with my Christmas gift shopping! I really made it a point to shop early because malls will be jam-packed soon as Christmas draws near. I am sure that by early December, my gifts will be under our Christmas tree already. I really recommend for everyone to shop early to avoid much hassle. You can still pick a lot of items because more stocks are still available unlike when you shop the last minute. I have some few friends who are dog lovers just like me so dog gift baskets are perfect gift for them. If you are comfortable shopping online, you must shop early as well to avoid shipping delays. You know how busy delivery services on those days so better yet start now. You can send out christmas breakfast gift baskets for your friends and relatives too. I always enjoy shopping for Christmas gifts but there are times it’s hard what to give to a specific person. Before hitting the stores, be sure to have your list with you as it can be very handy and useful. It was in September when cousins Aldrich Talonding and James Bucong guested at Ellen Show. These 2 young men were discovered in Youtube by Ellen staff when they sang "Dance with My Father Again." Soon after they were invited to come to the show to perform. How lucky they are to have performed Internationally at the top rating show of Ellen. The boys are indeed so happy and they spoke quite well during the interview and when they sang too. The voice of Aldrich was amazing and it impressed Ellen and her guests and they have given them a standing ovation. After the performance, Ellen gave Aldrich a guitar, piano, and $10,000. AMAZING! When they got back here in the Philippines, there are numerous guesting that they did and they were asked about their experience at Ellen Show. He has a lot of money to spend for his family and he can even buy a guitar nut at musicians friend to pair it with his new guitar. I also learned that James was given an iPad at the backstage too that made him so happy. Good job guys!